Richard Somers was born during the American Revolution on September 15, 1778 at the home and Tavern of his father, Col. Richard Somers, an officer in the New Jersey Revolutionary militia and a privateer with a letter of marque allowing him to attack British ships. 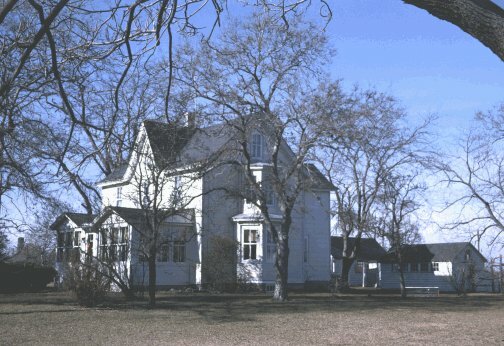 The house, on the corner of Shore and Bethel Roads, is seen in the photo as it stood in the 1960s. In the 1970s it was remodeled into an office building that still stands. A historic marker was placed near the sidewalk and Veterans Park is just across the street. Somers, New York – Westchester Country. In the years following the Barbary Wars, practically every town and city in America named streets after the heroes of Tripoli, especially Stephen Decatur and Richard Somers, who sailed the first USS Intrepid into history. There's a Decatur Street in Somers Point, and in Cape May, the Ugly Mug and Merion Inn are located on Decatur Street (though this street may be named after Stephen Decatur, Jr.'s father, Commodore Decatur, who spent summers in Cape May). 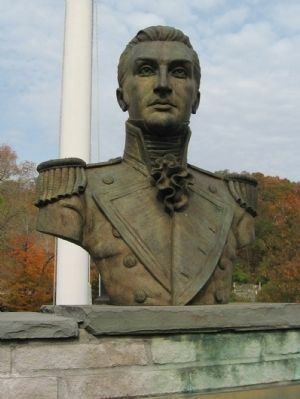 Originally called Stephentown, the New York state town changed its name in 1808 to Somers, in tribute to Richard Somers (1776 – 1804), a young naval officer from New Jersey who lost his life in the war with Tripoli. Location. 41° 19.801′ N, 73° 41.006′ W. Marker is in Somers, New York, in Westchester County. Marker is on Somerstown Turnpike (U.S. 202) 0.1 miles west of New York Route 116, on the right when traveling west. Click for map. Located in Ivandell Cemetery. Marker is in this post office area: Somers NY 10589, United States of America. Credits. This page originally submitted on October 29, 2010, by Michael Herrick of Southbury, Connecticut. This page has been viewed 76 times since then. Photos: 1, 2, 3, 4. submitted on October 29, 2010, by Michael Herrick of Southbury, Connecticut. Erected 1994. The mayors and municipal leaders of the city of Somers Point, New Jersey and the city of Somers, New York will meet later this month in Somers, New York and exchange keys to each other's cities. American Military Attache Brian Linvill, US Ambassador to Libya Gene Cretz and his wife Annette stand by the American flags they have placed at the graves of the remains of the US Navy sailors from the USS Intrepid at the Old Protestant Cemetery in Tripoli last Memorial Day, 2010. Thanks to Sally Hastings for providing this shot of the portrait of Richard Somers that hangs in the Somers Point, NJ municipal hall. More than two centuries after he was killed on the Mediterranean Sea fighting the Barbary pirates, U.S. Navy Master Commandant Richard Somers remains a regular topic of conversation in the town named for his family, Somers Point, N.J. The talk heated up considerably in the past week, after the House passed an amendment calling for the remains of Somers and 12 of his crew members to be returned to the United States from Libya, where they were buried on the coast of Tripoli in 1804. The measure, which was included in the Defense authorization bill approved 322-96 on Thursday, was sponsored by Reps. Mike Rogers, R-Mich., and Frank LoBiondo, R- N.J. But it was really the result of 207 years of effort by the deeply rooted Somers family of New Jersey. Richard Somers was only the most recent patriotic hero in the family when he died in the line of duty on September 4, 1804. His great-grandfather, John Somers, helped establish Somers Point in the late 1600s, and his father, Col. Richard Somers, was a member of Gen. George Washington's inner circle during the Revolutionary War. So when President Jefferson declared war on the Barbary States of North Africa rather than pay tribute for protection as the British Navy had done for years, Master Commandant Somers led a small but fast ship, the USS Intrepid, into Tripoli harbor for a series of skirmishes with the pirates. First, Somers and his 12-man crew recaptured the USS Philadelphia (sic 1. ), which had run aground while chasing pirates and had its 300 crew members taken prisoner. Then Somers took the Intrepid, loaded with explosives, on a daring nighttime raid into the harbor, only to have it blow apart before it reached the shore. The bodies of the 13 men who had been aboard washed up on the shore of Tripoli, where pirates dragged them through the streets, fed them to wild dogs, and ordered some of the U.S. prisoners (sic 2)to bury them on the beach. Ever since word of the loss reached the United States, members of the Somers family along with descendants of poet Henry Wadsworth Longfellow, whose uncle was second-in-command on the Intrepid - have been lobbying for repatriation of the remains of the ship's crew. The efforts had long been opposed by the old War Department, and later by the Pentagon, which argues that it considers Tripoli to be the crew's final resting place, just as many war he- roes remain buried where they were killed. But the Somers family argues that only some of the crew members were placed in a cemetery many years later and that the remains of the rest were ignominiously left on the beach in unmarked graves. The family paid for an archaeological dig on the Tripoli shore in 2006 and military buttons from the Barbary Wars were found along with bones and bone fragments. The Somers family also retained a veteran public-affairs and international consultant, Michael Caputo, who recommended a direct appeal to Libyan leader Muammar el Qaddafi several years ago. A meeting was set up with his heir apparent, son Seif al-Islam el Qaddafi, when Israel attacked Lebanon and Qaddafi backed away from U.S. contacts. Now, with the regime on the ropes as a result of the civil uprising and NATO's assistance, Caputo urged the Somers family to be prepared for a chance to have the remains repatriated if Qaddafi cedes power. "We can't do it on our own - it's a time of war," Caputo said. "But we need to be ready when the window of opportunity opens, because it's going to be brief." The amendment in the Defense authorization bill now must be approved by the Senate, where supporters fear a single member could have it killed at the behest of the Pentagon. Caputo said that the Somers family is girded for battle - it has lined up support from the American Legion to lobby senators for the re- patriation amendment in the weeks ahead. Sic 1. Somers' friend Lt. Stephen Decatur led the mission aboard the Intrepid to sink the USS Philadelphia in Tripoli Harbor. The success of that mission gave them the confidence to try the mission that led to Somers' death. Sic 2. The prisoners of the captured frigate USS Philadelphia, led by Capt. Bainbridge, Lt. Porter and Dr. Johathan Cowdery requested they be let out of their dungeons in the old castle fort to bury the dead, and did so. Simon Denyer, a Reuters and Washington Post correspondent based in India, was in Tripoli when he contacted me via email after reading this blog and using some of the information and maps that are provided. He then called me from Tripoli and asked directions to the Old Protestant Cemetery - about a mile east of the Old Castle Fort on the Coast Road. He found it, but found it locked and secure, which is good. Here is his article published in the Washington Post. TRIPOLI – In an unmarked grave in a corner of Tripoli’s Green Square, where supporters of Libyan leader Moammar Gaddafi stage daily rallies to denounce NATO and the West, lie the remains of eight American sailors who died here more than 200 years ago. Five others in their crew are buried under an olive tree in a small, white-walled Protestant cemetery overlooking the harbor about a mile away. The men were killed in what’s known as the First Barbary War, a war that effectively led to the creation of the U.S. Navy. Dispatched to the region by Thomas Jefferson to end piracy against American merchant vessels in the Mediterranean, the sailors set out to destroy Tripoli’s naval fleet in a daring covert mission. The mission failed, but some say it qualified them as the earliest precursors of today’s Navy Seals. 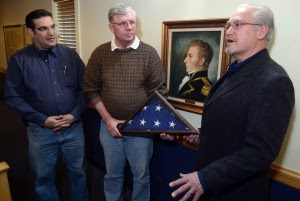 For generations, the sailors’ families have been fighting to have their remains repatriated. And now, as the U.S. and its allies pummel Gaddafi’s compound, their efforts are gaining force. On Thursday in Washington, the House approved a defense bill that would require the Pentagon to return them to the United States and give them a military funeral. Two centuries ago, Tripoli’s ruler, Pasha Yusuf Karamanli, made his living by piracy, exacting tributes from countries like Britain and France in return for not attacking their ships. The United States toyed with appeasement and diplomacy at first, but then Karamanli’s demands grew too great for a new nation desperately short of cash and war broke out. A half-hearted and largely ineffective naval blockade of Tripoli followed, before naval commanders tried to turn up the heat. In September 1804, 13 sailors from the USS Intrepid set out on a ketch packed with explosives. Their mission: sail up to Tripoli’s harbor fortress and blow it up. But their boat was spotted before it reached its destination. It was attacked from the shore and exploded and the sailors, led by Capt. Richard Somers, all perished. Their bodies were washed up on the shore and fed by Tripoli’s ruler to a pack of wild dogs, before being dumped unceremoniously in mass graves. The war was immortalized in the Marines’ Hymn, which promises to fight the nation’s battles “from the halls of Montezuma to the shores of Tripoli.” And, for decades, Somers' descendants and others have been pushing to have the remains of the 13 sailors returned to the United States. The family of poet Henry Wadsworth Longfellow has also joined the cause. Longfellow’s uncle, Lt. Henry Wadsworth, after whom he was named, also fell in the battle. Rogers chanced on the story on a visit to Tripoli in 2004 and has championed their cause, demanding their remains be reburied in the Tomb of the Unknowns in Arlington National Cemetery. With Libya’s permission and the help of the U.S. Embassy, the run-down cemetery where five of the men lie was restored in recent years. The grave in Green Square was also located, and buttons thought to be from Somers' officer’s coat were found. Ironically, the only key to the cemetery is believed to have been kept at the embassy, which was evacuated in February, and then burned and ransacked by a pro-Gaddafi mob. In a twist with eerie parallels to today, the First Barbary War finally began to swing the United States’ way after Gen. William Eaton sponsored rebels who invaded from the east and overran the city of Derna. But Jefferson had dispatched the naval force without a clear mandate to defeat Karamanli and, just as victory seemed possible, his commanders chose to negotiate with the pirate master instead. A peace deal was signed and the U.S. secretly paid the pasha $60,000 as ransom for the release of more than 300 U.S. sailors who had been captured earlier. Tripoli’s ruler emerged stronger than ever, while the people of Derna who had supported the rebellion were abandoned. Piracy committed by the Barbary States of Tripoli, Tunis and Algiers continued to flourish for another decade, until the Second Barbary War, when the United States — and then Britain and the Netherlands — returned to finish the job more decisively and end Mediterranean piracy for good. More than two centuries after they died off the coast of present-day Libya, the remains of the first 13 Navy commandos in U.S. history — in the words of one supporter, the “earliest Navy SEALs” — are one step closer to coming home after the U.S. House voted last week to insist the Pentagon get them back. Brushing off prior opposition from the Pentagon, House lawmakers attached the directive to the annual defense policy bill that cleared the chamber on Thursday, with backers saying it was time to honor the daring men as fallen heroes. The commandos were part of then-President Thomas Jefferson’s war against the Barbary Pirates, who terrorized shipping off the coast of North Africa in the early 1800s. They died while on a stealth mission to infiltrate Tripoli's harbor and sail a flaming ship into the enemy fleet that lay anchored there, trying to destroy it and force the release of U.S. sailors the pirates had taken prisoner on land. Their ship, the USS Intrepid, caught fire prematurely — either by accident or because it was hit by a shot from the enemy, and all 13 men perished. The commandos’ bodies were recovered by the residents of Tripoli. According to accounts, the remains were fed to dogs, then the U.S. prisoners of war were forced to bury their comrades. At some point, five of the sailors’ remains ended up at a separate location known as the Old Protestant Cemetery. Now, finally, the effort to bring the commandos’ bodies back home is gaining traction, with last week’s House vote. Of course, all of this might have been a lot easier — except for the fact that the bodies seem to be a low priority for the military and that Libya is involved. Mr. Caputo said after efforts to get the U.S. government involved went nowhere, the descendants of the 13 commandos began to engage Col. Moammar Gadhafi’s family directly in 2004. Early on, that bore fruit: U.S. relations with Libya were thawing at the time, and while that meant the State Department was focused elsewhere, the family-to-family talks were paying off. But then, after Israel attacked Lebanon in 2007, the project got tougher. The United States was seen as Israel’s protector, which made any gestures toward America a tough sell, Mr. Caputo said. Still, during the good years, the two unmarked grave sites had been identified, and archaeologists even did a preliminary dig that found buttons likely to have come from U.S. Navy coats at the time. “They know where it is, we know where it is, but it remains unmarked. It’s still a place where people walk and stand. In fact, it’s where Gadhafi has his anti-American rallies,” Mr. Caputo said. The cause has been championed by descendants of the men and by the town of Somers Point, N.J., named after the family of Lt. Richard Somers, who led the band of commandos on their fated mission. The Senate still must take up the legislation, though, and repatriation backers fear that the Pentagon could try to stoke opposition in the upper chamber. Trying to head off those efforts, repatriation backers are rallying military veterans groups to press their senators to support reburial. The Pentagon referred questions directly to the Navy on Friday, which didn’t provide comment in time for this article. But in 2008 Adm. Gary Roughead, chief of naval operations, wrote Mr. Rogers opposing efforts to repatriate the remains. Adm. Roughead said the Navy in 1949 held a formal memorial ceremony for the sailors at the gravesite, and said he did agree the site needs better care. There are historical precedents, however, for repatriation, including naval hero John Paul Jones, whose remains President Theodore Roosevelt ordered be brought back from Paris and reburied at the U.S. Naval Academy at Annapolis. And those pushing for repatriation said the gravesite on the beach is in danger of being washed out to sea. Mr. Caputo, who compared the sailors to the “earliest Navy SEALs,” said the recent Navy SEAL operation to kill Osama bin Laden brings the issue of fallen troops to a head. “What would have happened if they’d failed, they were dragged through the street, fed to a pack of wild dogs. What would have happened? Would we have left them there?” he said. Somers Point Delegation meets with Rep. Mike Rogers (R. Mich) and Rep. Frank LoBiondo (R. NJ) in Washington on April 15, 2011. From left: Chipp Reid, Frank LoBiondo, Greg Sykora, Sally Hastings, Walt Gregory, Jack Glasser, Dean Somers, Bill Kelly, Michael Caputo and Mike Rogers. (WASHINGTON, DC) - On Thursday the United States House of Representatives passed a bill including an amendment authored by U.S. Reps. Mike Rogers, (R-MI), and Frank LoBiondo, (R-NJ), that would require the Department of Defense to repatriate the remains of 13 US Navy commandos buried in mass graves in Tripoli, Libya since 1804. The amendment - which would repatriate, identify and honor the sailors with a military funeral - was attached to the National Defense Authorization Act (NDAA). After passing the full House, the NDAA now heads to the US Senate for consideration. "Our family is delighted and encouraged by the passage of the NDAA with the Rogers-LoBiondo amendment intact," said Dean Somers of Somers Point, New Jersey, and descendent of Richard Somers, the 19th century commander of the USS Intrepid. "We've still got a long way to go, but we're more and more hopeful every day." The City of Somers Point, named after the heroic Master Commandant's family and still their residence, has worked on repatriation for decades. Additionally, the descendants of American poet Henry Wadsworth Longfellow wish for the return of the remains of his uncle, Lt. Henry Wadsworth, who served as second in command on the fire ship Intrepid when it was lost during the Barbary Wars. Born shortly after the failed mission, the legendary poet was named after his heroic uncle. Family and civic activists were particularly appreciative of the efforts of the national American Legion, which is helping marshal support for repatriation. "The American Legion believes that the nation has a solemn responsibility to use every reasonable effort to bring home those killed in the service of our country," said Barry A. Searle, Director of the National Security Division at headquarters of the veterans service organization. "We are truly thankful to the House for its leadership in this matter of deep and abiding concern to the families, our city and our nation," Somers Point Mayor Jack Glasser said. "Still, we know the battle for Senate approval of the Rogers-LoBiondo measure may be difficult. We're asking veterans and patriotic Americans across the country to contact their US Senator and urge them to support this effort to bring our boys home after two centuries." Somers and his crew were lost on an ill-fated mission to destroy Tripoli's naval fleet during the Barbary Wars of the early 19th century. When their bodies of America's first Navy commandos washed up on the beach in Tripoli, the bashaw - the king of the pirates - invited a pack of dogs to devour them as American prisoners of war looked on. These 13 naval heroes remain buried today, their remains jumbled together in two Libyan graves. One of those graves is unmarked and underfoot on Green Square, where Gadhafi has held his anti-America rallies for decades. The remains of Richard Somers — one of our nation’s greatest military heroes — are one step closer to returning to his Atlantic County home some 207 years after he and 12 other Navy commandos were killed during the First Barbary War. The House of Representatives on Thursday passed an amendment that would require the Department of Defense to unearth from two mass graves in Tripoli, Libya, the remains of the 13 commandos killed in the 1804 explosion of the USS Intrepid in Tripoli Harbor. The Intrepid was on a mission at the time to destroy Tripoli’s naval fleet. Richard Somers was 25 at the time. “One of our nation’s greatest heroes is closer to coming home to Somers Point,” said U.S. Rep. Frank LoBiondo, R-Ventnor, one of the authors of the amendment. As their bodies washed ashore, LoBiondo’s staff noted the sailors were fed to a pack of dogs. American prisoners of war from the USS Philadelphia were forced to bury their remains outside the walls of a castle fort. “The Department of Defense never acknowledged the disgraceful burial these heroes underwent,” LoBiondo said. The two mass graves are in “terrible disrepair, and one is about to wash out to sea,” said U.S. Rep. Mike Rogers, R-Michigan, co-author of the amendment with LoBiondo. “One of the mass graves is located near the Tripoli plaza where (Libyan President) Muammar Gaddafi has held his anti-American protests for decades. Knowing the specific burial location “for close to 200 years, the Somers family has requested that his remains be returned,” said Sally Hastings, president of the Somers Point Historical Society. The House measure — which would not occur until after military activity in Libya ceases — would permit the descendants of the sailors to select the burial site, Hastings noted. “There are a lot of Somers descendants living in this area,” she said, referring to the town one travels through to get to Ocean City. There are two Somers family burial sites in town. One is at the New York Avenue School. “That’s where the family intended for him to be buried,” Hastings said, noting both of his parents — Richard and Sophia — are buried at the site. There is also a memorial for the war hero at that site. Local campaigns to bring Richard Somers’ remains home have existed for years. “These people have worked tirelessly,” LoBiondo said. In March, town officials were contacted by the office of U.S. Rep. Mike Rogers, R-Michigan, chairman of the House Intelligence Committee. LoBiondo is a member of that committee. “He said he was interested in the story for a long time,” Hastings said. She joined Mayor Jack Glasser and others in a trip to Rogers’ Washington office in April. The amendment – which would repatriate, identify and honor the sailors with a military funeral through existing federal funding – was attached to the National Defense Authorization Act, which passed the House by a vote of 322 to 96. “We have the opportunity to do the right thing — a lot of years later,” LoBiondo offered. Washington: The US House of Representatives voted Thursday to repatriate from Libya the remains of 13 navy commandos killed in 1804 during the First Barbary War and buried in mass graves in Tripoli. The measure, an amendment to a $690 billion defense bill, passed by voice vote. But it acknowledged that no action should be taken until the end of the current war in Libya pitting loyalist troops against rebel forces seeking to oust longtime leader Muammar Gaddafi. "The United States has an obligation to leave no member of our military behind, regardless of how long ago they were killed," said Congressman Mike Rogers, an army veteran who sponsored the bill with fellow Republican Representative Frank LoBiondo. "Bringing the remains of those brave members of our military home and giving them a proper military funeral will finally end a tragic story that has lasted far too long." The American sailors, the first US commandos and precursors of today's prestigious Navy SEALs, were killed when the USS Intrepid exploded in Tripoli Harbor. After washing ashore, their bodies were fed to a pack of dogs as US prisoners of war looked on before being dumped into two mass graves, according to Rogers. He said the sites were in "terrible disrepair" and one was about to wash out to sea. The First Barbary War of 1801-1805 was the first of two wars fought between the United States and a group of North African nations known as the Barbary States. The House of Representatives has passed a measure calling for the Defense Department to bring home the remains of 13 sailors buried in Tripoli more than 200 years ago. The sailors were aboard the USS Intrepid, which exploded and sank in 1804 while on a mission during the First Barbary War. After washing ashore, their bodies were fed to dogs. What was left was unceremoniously buried, although most of the remains were transferred to a cemetery in Tripoli more than 100 years later. The provision to bring them home is part of the latest National Defense Authorization Act, which still has to be passed by the Senate. It is unclear whether the measure will be part of the final version of the bill. U.S. Rep. Mike Rogers, R-Mich., introduced the bill, which would not take effect until after the current NATO campaign against Libya ends. “Bringing the remains of those brave members of our military home and giving them a proper military funeral will finally end a tragic story that has lasted far too long,” Rogers said in a news release. In a separate news release, a descendant of Intrepid Captain Richard Somers said his family was “delighted and encouraged” that the measure was included in the House version of the authorization act. "We've still got a long way to go, but we're more and more hopeful every day," Dean Somers said in the news release. WASHINGTON – For more than 200 years, the remains of 13 U.S. sailors have been interred in Tripoli, and now a congressman is calling on the Defense Department to bring them home. The USS Intrepid exploded and sank in 1804 while on a mission during the First Barbary War to destroy the Tripolitan Fleet. The captain and 12 volunteer officers were killed. When their bodies washed ashore, they were fed to dogs, dragged through the streets and dumped into holes, said U.S. Rep Mike Rogers, R-Mich.
Rogers said it is only a matter of time before Libyan dictator Moammar Gadhafi is deposed, so it is important to get ready to work with a new Libyan government to bring the Intrepi’ crew back to the United States. He has been working on this since he saw some of their graves during a visit to Libya in 2004. “One of the places there is right by the square where they regularly protest the United States of America – hardly a place that you would like to call your final resting place when you’ve sacrificed so much for your country,” said Rogers, an Army veteran. After feeling the Navy was unwilling to pursue the issue, Rogers introduced a bill earlier this month that would require the Defense Department to exhume the sailors and bury them in the United States. The bill, which is still in committee, requires those remains that could not be identified to be transferred to the Tomb of the Unknowns at Arlington National Cemetery. For more information, go to "The Intrepid Project." The House has passed a bill that includes an amendment authored by U.S. Reps. Mike Rogers, MI-08, and Frank LoBiondo, NJ-02, that would require the Department of Defense to return to the United States 13 Navy commandos buried in mass graves in Tripoli, Libya since 1804. The amendment – which would repatriate, identify and honor the sailors with a military funeral – was attached to the National Defense Authorization Act. Rogers and LoBiondo had introduced their own bill on it, H.R. 1497. "The United States has an obligation to leave no member of our military behind, regardless of how long ago they were killed," said Rogers, an Army veteran. "Bringing the remains of those brave members of our military home and giving them a proper military funeral will finally end a tragic story that has lasted far too long." In September of 1804, the 13 American Sailors were killed in the explosion of the USS Intrepid in Tripoli Harbor. The Navy’s first commandos – precursors to today’s Navy Seals – were on a mission to destroy Tripoli’s naval fleet during the First Barbary War. When their bodies washed ashore on the beach in Tripoli, they were fed to a pack of dogs as American prisoners of war looked on and then dumped into two mass graves. Both are in terrible disrepair, and one is about to wash out to sea. One of the mass graves is located near the Tripoli plaza where Muammar Gaddafi has held his anti-American protests for decades. Rogers joined the effort to bring the remains of the Navy commandos back to the United States for a proper burial after visiting the grave sites in 2004. "The way that they were treated after dying in service to their country is inexcusable," LoBiondo said. "They deserve to be buried with dignity by their families on their own home soil, especially after sacrificing so much for their country." Editor’s note: No action would be taken until after the military activity in Libya ends. Greg Sykora, Somers Point Mayor Jack Glasser and Walt Gregory with the portrait of Master Commandant Richard Somers in the Somers Point Municipal Hall. Mayor Glasser holds a flag that had flown over the US Embassy in Tripoli. SOMERS POINT – After 207 years, local leaders say the ongoing effort to return the remains of Richard Somers has the most momentum in ages. In April, a delegation from Somers Point traveled to Washington, DC and met with Congressmen Mike Rogers (R- MI) and Frank Lobiondo (R-NJ) to discuss the return of the remains of Somers and 12 other U.S. Navy commandos buried in unmarked mass graves on the shore of Tripoli, Libya. This week, Rogers will address the floor of the House of Representatives on behalf of HR 1497 as an amendment to the National Defense Authorization Act, expected to be voted on this week. The bill, which was introduced by Rogers and co-sponsored by LoBiondo on April 12, gained the support of co-sponsor Rep. John Carter (R-TX) on April 15. If passed, it will direct the Secretary of Defense to take whatever steps may be necessary to exhume and transfer the remains of certain deceased members of the Armed Forces buried in Tripoli, Libya, and for other purposes. Mayor Jack Glasser said due to the political unrest in Libya, the focus of national attention has shifted to the shores of Tripoli, where the remains of Somers and his crew rest. Sent to fight Barbary pirates in 1804, Master Commandant Somers and his 12­-man crew of the Intrepid all perished when the explosives on board the ship detonated prematurely Sept. 4, 1804. The intended mission was for the men to ignite the fire ship and destroy Tripoli's naval fleet during the Barbary Wars of the early 19th century. He said for three years, he has been committed to this effort and has joined forces with Historical Society President Sally Hastings and the Committee to Return Richard Somers, which includes Chairman Walter Gregory and members Greg Sykora and Dean Somers, of the Somers family. It was that contingent of supporters who met with Rogers and LoBiondo to get the ball rolling last month. “My father, my father's father, and his father's father have wanted the remains of Master Commandant Richard Somers returned home, and we've worked for it since he and the men of the USS Intrepid were lost in Libya in 1804," said Dean Somers in a press release by The Intrepid Project. "This is long, long overdue, and it wasn't until we met recently with Rep. Frank Lobiondo and Chairman Rogers when we thought it was finally possible." Glasser said it is his duty to bring Somers home to the shores off which he learned to sail. More information about this project can be found at www.richardsomers.org and www.intrepidproject.org. WASHINGTON - The U.S. was deep in debt, propelled into the red in part by an exhausting war. Its citizens were under siege by evildoers from the Muslim lands of North Africa. Declaring enough was enough, American forces launched attacks on the enemy, with Tripoli most directly in the cross hairs. While that scenario is remarkably similar to events of today, it actually took place more than 200 years ago, when the U.S. was engaged in a war against the Barbary pirates, who were wreaking havoc on our merchant ships on behalf of the Muslim rulers of what today are Libya, Tunisia, Morocco and Algeria. Tying that time to the current U.S.-NATO airstrikes on behalf of besieged rebels in Libya is one unfinished chapter of the earlier conflict -- variously called the First Barbary War or the Tripolitan War of 1801 to 1805. And that unresolved matter has recently reached Congress, where two lawmakers want to right what they consider a grievous wrong. 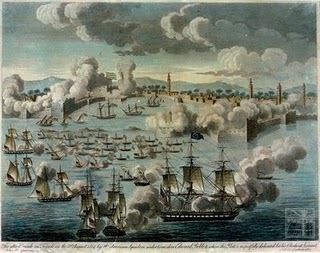 In 1804, U.S. naval vessels launched a series of attacks on the enemy fleet in Tripoli's harbor, without much success. One of the most creative was attempted by the USS Intrepid, which its sailors fashioned into the ship equivalent of a roadside bomb. Packed with explosives, the Intrepid was to sail into the harbor, where it would be torched and the enemy fleet moored there would be destroyed by the blast. But the Intrepid blew up prematurely on Sept. 4, 1804, killing the 13 American sailors aboard. Among the dead was Henry Wadsworth, uncle of poet Henry Wadsworth Longfellow. The men were buried in two mass graves in Libya, according to a series of contemporary and later accounts of witnesses to their location. But efforts to repatriate the remains to the U.S. have been thwarted since they began in 1840. On April 12, two Republican congressmen -- Reps. Mike Rogers of Michigan and Frank LoBiondo of New Jersey -- introduced HR 1497, a resolution directing the Defense Department to arrange the exhumation and transfer of the remains to the U.S.
Space has been reserved for the sailors at Arlington National Cemetery. The lawmakers hope the attention America is now giving to Libya will translate into a groundswell of support to finally bring the commander and his crew home. In another echo from that troubled part of the world, the Navy officer who commanded the USS Cole when it was attacked in the Yemeni port of Aden is running for a seat in Congress. Retired Cmdr. Kirk Lippold, a Nevada Republican, has announced that he will vie for the seat of GOP Rep. Dean Heller. Heller has been appointed to fill the Senate seat vacated by John Ensign, who resigned. Lippold, 51, was in charge on Oct. 12, 2000, when a dozen al-Qaida operatives in a small boat full of explosives pulled up close to the U.S. warship and detonated their makeshift bomb. The blast killed 17 sailors and injured dozens more, in what was then al-Qaida's most deadly attack on Americans. The 9/11 attacks came less than a year later. A Navy investigation said Lippold, a 26-year veteran of the sea service, probably could not have prevented the attack, and Navy reviewers recommended him for promotion to captain. But the U.S. Senate did not confirm him. Among others he is likely to face in the primary is Sharron Angle, a Tea Party-movement stalwart who unsuccessfully tried to unseat Senate Democratic leader Harry Reid last fall. 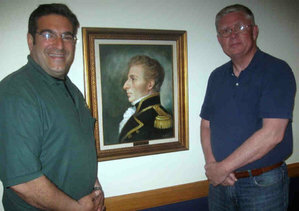 Greg Sykora of the Return Richard Somers Committee of the Somers Point Historical Society and Somers Point Mayor Jack Glasser stand next to portrait of Master Commandant Richard Somers that hangs on the wall of the Somers Point Municipal Hall. 1775 October 13 American Revolutionary Navy commissioned. 1778 September 15 Richard Somers, Jr. is born during the American Revolution at the home and tavern of his father, Col. Richard Somers, Sr. It is a remodeled building that still stands today as the Somers Manor office building at the corner of Shore and Bethel Roads, Somers Point. There is a small marker at the site, and the Veteran’s Park is just across the street. 1778 October 15 Battle of Chestnut Neck, included Col. Richard Somers, father of Master Commandant Richard Somers. A monument with Somers’ name stands at the base of the Parkway Exit (#48) just south of New Gretna. 1783 March. Algierian pirates seize two American merchant ships en route from Marseille to Gibraltar. 1783 September 18. John Barry petitions the Pennsylvania General Assembly for “benefits and emoluments” for his military service during the Revolution, while living on Spruce Street, between Third and Fourth. 1784 October 11 – Morocco pirate corsair seize American brig Betsey. 1785 USA opens diplomatic relations with Barbary States of Morocco, Algiers, Tunis and Tripoli. 1785 John Barry acquires Strawberry Hill, a plantation house four miles north of Philadelphia on the Delaware. 1786 January 4 Dr. Benjamin Rush visits Barry at Strawberry Hill. 1787 April 19 John Barry’s nephews Michael and Patrick Hayes arrive from Ireland. 1787 December. John Barry Captain of the ship Asia, travels to China. 1787 May 14 State delegates convene a Federal Convention in Philadelphia, meet throughout the summer. 1787 Enoch Stillwell (brother of Richard’s mother) dies, orphans Anna, Sophia and Savage Stillwell, move in with Somers family. 1788 June 4 Captain Barry sails ship Asia up Delaware returns from China. 1788 June 21 New Constitution adopted only after John Barry strong arms two delegates in order to ensure a quorum. 1789 January Schoolmaster John Barry begins teaching at boys Free Academy 3rd St. in Philadelphia. 1789 March 4 New government begins with first presidential election. 1789 April 30 George Washington sworn in. John Adams Vice President. 1790 May 31 George Washington signs first copyright act in Philadelphia. 1790 December 6 Third session of first Congress opens in Philadelphia. 1791 April 11 Sultan Sidi Muhammad of Morocco dies, son al-Yazid assumes power. Thomas Barclay appointed first counsel to Morocco. 1791 Richard Somers attends Hunter School, Woodbury, N.J.
1792 Somers takes classes in navigation. 1792 August 8 See Ben Franklin’s Pennsylvania Gazette. 1793 John Barry “retired” at Strawberry Hill. 1793 December 16 – President Washington notifies Congress that Portugal negotiated a truce with Algiers and the Barbary pirates were again in the Atlantic. Thomas Fitzsimmons consults with Barry and shipbuilder Joshua Humphreys about building a fleet of warships. 1793 - 15 year old Richard Somers, first mate on family schooner trading in West Indies, takes command upon the death of the captain and returns safely home. 1794 - Navy Act of 1794. 1794 March 27 an act of Congress passed to create a naval force by building six new frigates, under the supervision of John Barry. 1794 June 14 Washington sends John Barry “to form and train a class of midshipmen who would then be commissioned as Ensigns, and form the nucleus of a new American navy.” Barry commissioned #1 Captain, United States Navy. 1794- Richard Somers attends private academy where he is ‘schoolmates with Charles Stewart, Steven Decatur, Jr., son of U.S. Navy Captain/Commodore Steven Decatur, Sr., and Richard Rush, son of prominent physician Benjamin Rush. 1794 September John Barry supervises the delivery of Georgia oak for the construction of the frigate USS United States. 1794 October 22 Richard Somers, Sr. dies (54 years old). 1795 April 9 Betsy Keen and merchant sea Captain Patrick Hayes married at Christ’s Church by the Reverend, Bishop William White, a co-founder of the academy, who had earlier married Barry and Sarah Austin. 1796 January Secretary of War McHenry reports that all six frigates could still be completed within the year. 1796 May Barry and Truxtun in Maryland ordering cannon at Cecil Furnace. 1796 July 8 Son born to Betsy Keen Hayes. 1796 September 19 Estimate for outfitting the United States with 305 officers and men, fifty-four marines, for one month $7, 285. 1796 – September 1796 – Schoolmaster John Barry ends teaching career at Philadelphia Academy. 1796 – Gheretti/Mastico, a French built Ketch launched (later to become USS Intrepid). 1797 - February 3 Richard’s mother Sophia dies. 1797 June 7 Treaty of Tripoli – Approved by Senate. [See: NARA Treaty Series #358 – American State Papers – Foreign Relations - #18-19. 1797 June 17 Notice of Treaty of Tripoli published in Philadelphia/Pennsylvania Gazette. 1797 July 10 Built in Philadelphia by Joshua Humphreys, the frigate United States is launched to a crowd of 30,000 people. John Barry Captain. 1798 March 9 Charles Stewart commissioned Lieutenant, predates Navy. 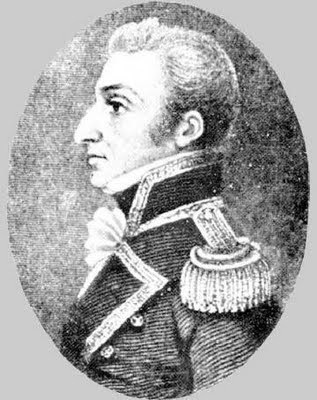 1798 April 30 Congress establishes Department of Navy, directed by secretary of cabinet rank, Benjamin Stoddert, Maryland merchant, who immediately gives John Barry necessary supplies to complete outfitting the USS United States. 1798 April 30 Midshipman’s warrants issued to Richard Somers and Steven Decatur, sent to sea on the shakedown cruse of the USS United States under Commodore John Barry. 1798 July 7 USS Untied States gets underway under Capt. John Barry with Decatur, Jr., Charles Stewart and Somers as Midshipmen, headed south for the West Indies in search of French ships. 1798 October 8 – USS US ordered off Newport, RI. 1799 January 20 Richard Somers given commission as Lieutenant. 1800 January 10 – To Be Rented – Great Egg harbor Residence of Col. Richard Somers, Apply to Wm. Jones Kean , Front St. Phila. 1801 Somers appointed first lieutenant to the Boston, a 28 gun, 250 man sloop sent to deliver Chancellor Livingston to France, and patrol the Mediterranean. 1801 USS Boston sails to France with new ambassador and family. 1801 December 22 Boston at Gibraltar. 1801 January 21Boston off Tripoli. Somers gets first view of Tripoli. 1801 June Eaton makes first contact with Hamad Karamanli, deposed pasha of Tripoli, and older brother of Yousuf. 1801 July USS Enterprise, Lt. Andrew Sterrett, takes on Tripoli (14) and leaves it destroyed. 1802 Congress orders the construction of four schooners, the Siren (16 guns), the Argus (16), Nautilus (12) and Vixen (12), with Somers, age 24, being given command of the Nautilus. 1802 February 2 US fleet off Tripoli to blockade harbor. 1802 September Boston returns home. 1803 February 28 Congress passes Act to pay for ships. 1803 April 11 Richard at Somers Plantation, launches new schooner, Goard Blossom at Mays Landing, Egg Harbor. 1803 May 13 Richard Somers ordered to oversee the refurbishing of the schooner Nautilus. 1803 May 21 Captain Edward Preble given command of the Mediterranean squadron, with flagship frigate USS Constitution (44). 1803 September 13 Commodore John Barry dies. Barry, former Captain of United States, and primary mentor of Stewart, Somers and Decatur, was offered command of the Mediterranean Squadron, but declined because of his health. 1803 Preble makes successful demonstration in Tangier against the emperor of Morocco. 1803 October 31 USS Philadelphia, Captain Bainbridge in command, runs aground off Tripoli, surrenders with full compliment of crew, 300 men. 1803 November 7 The Argus, under Stephen Decatur, joins Nautilus and Constitution in Gibraltar. 1804 June 2 USS Constitution, Enterprise, and Intrepid, converted to a floating hospital, anchor off Syracuse. Siren, Agrus, Vixen and Scourage (also a pirate prize) blockade off Tripoli. 1804 July Mediterranean squadron heads for Tripoli, lead by Preble’s flagship, the frigate Constitution, four brigs, the Argus, Siran, Vixen and Scourge, two schooners, Nautilus (Somers) and Enterprise (Decatur) and eight gunboats (156 guns in all). 1804 July 25 - August 28 - Battle of Tripoli. 1804 August 3 and 4 - Somers and Decatur lead flotillas of gunboats against Tripoli fleet, win decisively, though Decatur’s younger brother is killed, as is another young officer, whose body is never recovered. 1804 August 7 Attack made against Tripoli fleet. 1804 September 3 Attack made against Tripoli fleet. 1804 September 4 Somers leads the Intrepid back into Tripoli harbor rearmed as a fire ship, which explodes prematurely, killing three offices (Somers, Wadsworth, Israel) and ten seaman. 1804 September 5 Captain Bainbridge, skipper of the scuttled USS Philadelphia, and ship’s doctor Dr. Cowdery, (who would later become first chief surgeon of the United States), and a detachment of prisoners bury the 13 bodies that washed ashore Tripoli harbor, three identified as officers, 200 yards east of the old castle fort. 1804 September 9 William Eaton arrives and reports to Med Squad. Commodore Barron replaces Captain Preble as commander of U.S. naval forces in the Mediterranean. 1804 September 13 Commodore Samuel Barron issues secret – verbal orders – to Isaac Hull of the Argus, to facilitate Easton’s plans to support Hamid Karamanli. 1804 November 28 Plans instituted to convince Hamad Karamanli to retake Tripoli throne. 1805 February 25 Captain Preble arrives in New York, unexpectedly finds himself a hero. 53 Preble boys sign letter. 1805 – March 19 – President Jefferson receives Commodore Preble’s dispatch, learns of the loss of USS Philadelphia and 307 captured prisoners. 1805 March 6 US diplomat-warrior William Eaton and US Marine Corps Sgt. Presley O’Bannon, eight marines, 200 Greek mercinaries begin attacks across the desert from Egypt to Derna, and capture the port city east of Tripoli. 1805 April 28 With support from the Argus, Hornet and Nautilus, Eaton and company attack Derna, city falls in 2 hours, Stars & Stripes raised on conquered foreign soil for first time. 1805 June 11 Captain Hugh Campbell & USS Constellation anchors off Derna. Eaton learns of peace treaty, escapes with Hamad Karamanli, O’Bannon’s squad and other Christians, abandoning Derna. 1805 November Eaton returns to USA, a hero. 1805 December 11 Tripoli treaty submitted to Senate for ratification, paying $60,000 to Pasha Yousuf Karamanli ransom for USS Philadelphia prisoners, no tribute. 1806 April 17 Tripoli treaty ratified by Congress. 1806 May 27 John Rogers confers command of the USS Constitution and U.S. squadron to Hugh G. Campbell and returns aboard Essex. 1806 Nautilus arrives back in USA. Somers’ brother-in-law, William Jonas Keen pays prize money to officers and men for the capture of Brig Nomenato Crucifisso. 1806 March 17 Report published backing Eaton’s account. 1806 April 12 Senate ratified peace treaty with Tripoli (21-8), Congress votes to pay Hamad Karamanli $2,400 and $200 a month pension. 1807 Eaton reimbursed $12, 636, 60. 1807 January 1 Monument to the men who died off Tripoli set at the US Navy yard, Washington, D.C.
1807 – A. Burr stands trial for treason. 1808 James Madison becomes president. 1811 June 1 William Eaton (47) dies at Brimfield, Maine, relatively unnoticed. 1811 August 29 Constant, Jr. dies at sea in Cronstadt, Russia. 1812 August 25 Brig Edwin of Salem taken enroute from Malta to Gibraltar. Captain George C. Smith and ten man crew taken, with American passenger Mr. Pollard. Imprisoned in Algiers. 1813 New U.S. counsel Mordecai Manuel Noah appointed to Tunis. 1814 British capture Washington, burn Tripoli monument. It is repaired and moved to front of Capitol. 1813 to 1814 Schooner USS Somers deployed. 1814 Bey Hammuda dies of natural causes, succeeded by his brother Uthman. 1814 December 21 Bey Uthman assassinated by cousin Mahmud. 1815 March 2 Congress declares war on Algiers, granting the president authority to take whatever measures he deems necessary. 1815 May 20 Commodore Decatur’s squadron puts to sea. 1815 December 21 Peace treaty ratified, signed by President Madison on Dec. 26. 1815 Decatur and Bainbridge return to Tripoli to secure truce. 1815 August 2 Commodore Decatur arrives off Tripoli. 1815 August 5 Decatur obtains treaty with Pasha Yousuf Karamanli (also spelled Qaramanli ) “I trust that the successful result of our small expedition, so honorable to our country, will induce other nations to follow the example; in which case the Barbary states will be compelled to abandon their piratical system.” – Decatur. 1816 August, British under Lord Exmouth and Dutch bombard Algiers to secure truce. 1820 March 22 Stephen Decatur killed in a duel with Commodore James Barron. 1830 May 26 French invade Algiers. City falls July 5. 1842 James F. Cooper writes biography of Richard Somers. 1842 US Brig Somers deployed. Becomes involved in “mutiny” that inspires Herman Melville to write “Billy Budd”. 1846 December 8 – USS Somers sinks in gale storm off Veracruz, Mexico. 1850 January – Richard’s sister Sally dies. 1851 Monument erected at Somers’ family burial ground at Somers Point “In memory of Richard Somers…perished in the 25th year of his age in the ketch Intrepid in the memorable attempt to destroy the Turkish flotilla in the harbor of Tripoli…. 1850 January - Sarah Somers dies. 1860 Tripoli monument moved from Capitol to Annapolis. 1898 to 1919 Torpedo Boat USS Somers deployed. 1903 President Roosevelt orders the remains of John Paul Jones to be repatriated from Paris, France to Annapolis, Md., where he is reburied with honors. 1920 to 1930 USS Somers DD-301 deployed. 1930s Sometime in the 1930s, during the Italian occupation, the Italian Army uncovers the remains of five bodies from park during the construction of a new road. The five are reburied at the Old Protestant Cemetery. 1937 to 1947 USS Somers DD-381 deployed. 1938 In response to an inquiry form the American embassy in Rome concerning the fate of the men of the USS Intrepid, Mr. Mustafa Burchis, harbormaster of Tripoli, undertakes a meticulous examination of the old Jewish records, private Arab collections of letters, papers and diaries, and interviews innumerable descendants of residents of Tripoli at the time of the disaster, and completes a report of the matter that is transmitted to the US Embassy Rome. The report is said to have been lost in the chaos of WWII. 1942 Jul 11(Jun 11), The German army was defeated at El-Alamein, North Africa. 1949 April 2 - US Navy conducts ceremony at gravesite and places permanent marker. Captain of USS Spokane and a Prince Karamanli participate. 1959 USS Somers DDG-34 deployed. 1971 Quadaffi’s son Seif al-Islam (Sword of Islam) born. 1975 - Libya’s leader Muammar Qaddafi published The Green Book. The 3-part book rejects modern conceptions of liberal democracy and encourages the institution of a form of direct democracy based on popular committees. 1976 Americans Frank Terpil and Joseph McElroy deliver 50 revolvers to Libya. 1976 Former CIA official Ed Wilson begins selling tons of C4 explosives to Libya, along with experts to teach covert operations. 1977 May American Legion Magazine (Vol. 102 #4) publishes reports of Patricia Dougherty (of Leonia Borough Council, NJ) and her writer friend Melba Edmunds, who visit cemetery in Tripoli, finding it overgrown with weeds. 1977 Col. Moammar Gadhafi launched his Jamahariya, or "State of the Masses." 1979 Libyans attack US Embassy in Tripoli. 1982 Ed Wilson is lured out of hiding in Libya and brought to New York for arrest and trial. 1983 Wilson introduces sworn statement from CIA that Wilson didn’t do anything for the CIA after his retirement in 1971, is convicted, sentenced to 25 years and is incarcerated at federal penitentiary at Marion, Illinois. 1983 Nov 25, Syria and Saudi Arabia announced a cease-fire in PLO civil war in Tripoli. 1983 Edwin Wilson was convicted of running arms to Libya. In 2003 the conviction was thrown out because prosecutors knew he worked for the CIA and misled the court. 1984 Spring C4 explosives explode at homes of anti-Quaddafi Libyans in Manchester England, sparking demonstrations and the shooting murder of female British constable at Libyan embassy at St. James Square. Diplomatic relations between England and Libya broken, Libyans escorted out of the country. They leave behind some of the U.S. revolvers. 1986 May USS Somers discovered in 107 feet of water off Veracruz, Mexico. Salvage Expedition underway. 1988 December 21 Pan Am Flight 103 explodes over Lockerbie, Scotland. 1988 Dec 21, Pan Am Flight 103 was downed over Lockerbee, Scotland by a terrorist bomb. 270 people were killed aboard the Boeing 747. Libya was accused of responsibility for the bombing, which killed 259 people onboard and 11 on the ground. Two Libyan operatives, Abdel Basset al-Megrahi and A-Amin Khalifa Fahimah, were indicted in 1991 and thought to be in hiding in Libya. They were sent to the Netherlands for trial in 1999 and implicated Mohammed Abu Talb, a Palestinian terrorist jailed in Sweden. In 2000 Ahmad Behbahani (32) told a 60 Minutes journalist from a refugee camp in Turkey that he proposed the Pan Am operation and coordinated the 1996 bombing of the Khobar Towers in Saudi Arabia. He also claimed that Iran was behind the 1994 bombing in Argentina that killed 86 people. Behbahani was later called a fraud by the CIA and FBI. In 2001 a Scottish court convicted Abdel Basset Ali al-Megrahi, a Libyan intelligence officer, of murder in the 1998 bombing of Pan am Flight 103. A 2nd Libyan, Lamen Khalifa Fhimah, was acquitted. The conviction was upheld in 2002. In 2003 Libya set up a $2.7 billion fund for families of 270 people killed. 1989 Sept. 19 A Paris-bound French DC-10, UTA Flight 772, was bombed over the Sahara desert of Niger and all 170  passengers died. French authorities placed the blame on Libya’s Abdallah Senoussi, brother-in-law of Moammar Ghadafi and chief of foreign operations for the Libyan secret service. The six Libyan suspects were named by a French judge in 1998 and tried in absentia in 1999. The attack was in retaliation for French intervention on behalf of Chad in a war with Libya since the mid 1980s. In 2004 Libya signed a $170 million compensation accord with families of the people killed. 1992 Mar 25, Libyan leader Col. Moammar Gadhafi backed away from an offer to turn over two suspects in the bombing of Pan Am Flight 103 to the Arab League. 1992 Apr 15, Countries barred Libyan jets from their airspace and ordered diplomats to go home because of Libya's refusal to turn over suspects in the bombing of Pan Am Flight 103. U.N. Security Council imposed sanctions on arms sales and air travel against Libya to prod Gadhafi into surrendering two suspects wanted in the Pan Am 103. 1993 al Islam graduates from Tripoli’s al-Fateh University where he studied urban engineering; chairs the National Anti-drug Association of Libya. 1994 Historic Society of Pennsylvania (HSP) notifies the FBI that items from its collection are missing, (including the Somers ring). 1995 Sep 1, Moammar Ghadafi of Libya announced the expulsion of all 30,000 Palestinians from Libya. More than 1,200 ended up in a border camp between Libya and Egypt. 1995 Libya declared jihad against NATO, but no concrete action was taken. 1995 September 8 – Senator D’Amato introduces what would become ILSA – the Iran Foreign Oil Sanctions Act of 1995. 1995 December 20 – Senate passes ILSA, with an amendment sponsored by Senator Kennedy, that applies all provisions to Libya as well as Iran (ILSA) because of efforts of the families of the victims of the Dec. 21, 1988 downing of Pan Am 103. 1996 Jan, Louis Farrakhan visited Libya and received a promise of $1 billion from Col. Moammar Ghadafi. His tour also included stops in Iran, Nigeria and the Sudan. 1996 Feb, In Libya a plan to kill Moammar Ghadafi failed and several bystanders were killed. In 1998 David Shayler, a former member of the British intelligence services, revealed the information in France while fighting extradition to Britain. The British foreign secretary denied the attack. Shayler returned to London in 2000 to face charges. 1996 May 17, Libya was preparing to expel some of its 30,000 Palestinians. 1996 Nov 23 A member of the Fighting Islamic Group, Abdullah Guryou, hurled a grenade at Moammar Ghadafi in the desert town of Brak. Ghadafi was not hurt. 1997 December 23 FBI question George Csizmazia in theft of Somers ring. 1998 Dec 15, The 500 members of Libya’s General People’s Congress voted for conditional approval for the trial of Pan Am Flight 103 bombing suspects in a 3rd country. 1999 Jul 7, Britain and Libya announced a resumption of diplomatic relations. 2001 Jan 4, It was reported that Africans from Guinea, Niger, Nigeria, Ghana, Cameroon and Congo had resumed treks across the Sahara to Libya for better economic conditions. 2001 January 31 – Libyan suspect Abd al-Baset al-Magrahi convicted of the bombing of Pan Am 103. 2003 Apr 30, Libyan Foreign Minister Abdel Rahman Shalqam said his government accepted responsibility for the 1998 bombing of Pan Am Flight 103 over Lockerbie, Scotland. 2003 Aug 19, Britain introduces a United Nations resolution to lift sanctions against Libya after Tripoli accepts the blame for the Lockerbie bombing and agrees to compensate victims' families. 2003 Oct, A search of a German vessel bound for Tripoli, Libya, revealed uranium-enriching centrifuge gear. (WSJ, 12/31/03, p.A1). Container ship episode on high seas. German ship BBC China interdicted by USA, German, Italy, and uranium enrichment materials found. 2003 October 30 Federal Judge in Houston, Texas throws out the conviction of former CIA operative Edwin P. Wilson, who has spent 20 years in prison for selling arms to Libya. 2004 Jan 5, Pres. Bush extended a 1986 order of sanctions against Libya. 2004 Jan 14, A UN agency said Libya has ratified the nuclear test ban treaty. The treaty is 12 nations short of the 44 ratifications needed for it to enter into force. Once it comes into force, the treaty bans any nuclear weapon test explosion in any environment. 2004 January 26 US congressional delegation arrives in Libya, the first since Col. Muammar Gaddafi took power. 2004 February 23 Assemblymen John C. Gibson and Jeff Van Drew introduce AR – resolution No. 91 – Permanently establishing September 4th as Richard Somers Day in the State of New Jersey and AR No. 121 – requesting the federal government negotiate with Libya for the repatriation of Richard Somers and the crew of the USS Intrepid. 2004 Feb 26, The US lifted a long-standing ban on travel to Libya after Moammar Gadhafi's government affirmed that it was responsible for the bombing of Pan Am flight 103 in 1988. 2004 March 6 Sudarsan, (of Krafricabureau) reporting on Weldon’s trip to Libya for Philadelphia Inquirer, visits the cemetery but reports via email “the Libyans wouldn’t let me take a picture. I’m trying to change their minds.” Sudarsan never heard from again. 2004 Apr 27, Libyan leader Moammar Gadhafi arrived in Brussels, his first trip to Europe in 15 years. Gadhafi sought "full normalization" of relations and entry to the aid and trade program the EU runs with countries around the Mediterranean, including Israel. 2004 May 6, A Libyan court sentenced five Bulgarian nurses and a Palestinian doctor to death on charges they intentionally infected some 393 children with the AIDS virus as part of an experiment to find a cure. 9 Libyan health workers were acquitted. Under Libyan law, death sentences generate an automatic 60-day period for appeal. 2004 June Libya frees 28 detainees. 2004 July 29 The Sentinel “Gone, but not forgotten – Community, New Jersey work to bring home remains of Master Somers after two centuries. 2004 Oct 15, German Chancellor Gerhard Schroeder and Libyan leader Moamer Kadhafi clashed over Iraq during their first-ever meeting in Tripoli while German business leaders touted for business in the oil-rich former pariah state. Schroeder praised the reforms of Muammar Gaddafi and invited the Libyan leader to visit Germany. 2004 Dec 7, Libya listed three conditions under which it is prepared to drop charges against five Bulgarian nurses condemned to death on suspect charges of spreading AIDS..
2004 Dec 8, Seif al-Islam Gadhafi, son of leader Moammar Gadhafi, said Libya will soon pass new laws that limit capital punishment to a small number of crimes. 2005 January Somers Point officials send letter to Congressman LoBiondo, cc Sec. Navy Gordon R. England; Navy Historical Center. 2005 January Ambassador Profile – Director Ali Suleiman Aujali – Libya Shedding Its Pariah Status – Interview with Larry Luxner in The Washington Diplomat. 2005 Feb 19, Libyan leader Moamer Kadhafi and Egyptian Pres. Hosni Mubarak backed an African solution to the crisis in Sudan's Darfur region during 2 rounds of talks in Cairo. 2005 February Michael Caputo begins private, independent negotiations with the Gaddafi International Foundation for Charity Associations. 2005 July 6 David Talley, American Embassy Riyadh, reports from Tripoli: “I found your website as I was researching the cemetery of the five American sailors in Tripoli. I am currently in Tripoli and have visited the site of the cemetery and am going back this Friday with a team to clean it up. I will post photos and email them to you…” [See: Photos of American cemetery in Tripoli]. 2005 September 4 Attorney Seth Grossman organizes an assembly at the grounds of the Atlantic County Historical Society (ACHS), where the consensus is the location where Somers remains should be reburied once returned. 2005 September 20 Somers Point Mayor Dan Reilly writes letter to Gaddafi IFCA. 2005 September 27 Dean Somers writes to Gadaffi IFCA. 2005 Oct 17 Libyan Foreign Minister Abdel Rahman Shalgam rejected a call by US President George W. Bush for Tripoli to spare the lives of five Bulgarian nurses sentenced to death for infecting hundreds of Libyan children with the AIDS virus. 2005 October Michael Caputo uses letters from Reilly and Somers to begin backchannel negotiations with Libyans. He obtains $100,000 from an individual backer and hires a Libyan lawyer as a lobbyist and begins negotiations with Quadafi’s son and Charity Foundation. 2005 December 9 DOD POW/MP office identifies remains from 1968 Laos. 2006 January 15 Pierre Welch, Global Real Estate Advisor, USDS, sends photo of the Green Square gravesite. 2006 January Joint POW/MIA Accounting Command, Hawaii expresses interest. 2006 January - Michael Caputo says that Libyans excavated sections of park gravesite and found bones and buttons in mass grave. 2006 February 18 10 die in Libya demonstrations against Italy for caricature t-shirts. 2006 Apr 15 In Libya US singer Lionel Richie jived and rocked for an adoring audience in a concert to mark the 20th anniversary of a US raid on the North African country. Libya renewed a demand that Washington apologize and pay compensation. 2006 May 13 David A. Winters, ExVP Intrepid Sea, Air & Space Museum and Intrepid Fallen Heroes Fund offers assistance in Repatriation of original Intrepid crew from Libya, possible venue for official repatriation ceremony. 2006 May 21 Libyan journalist Daif al Ghazhl kidnapped from car in Tripoli. 2006 June 1 “BBC China, CIA, MI6” Article by Dr. Ludwing DeBracckeleer published. 2006 June 2 Body of Libyan journalist Daif al Ghazhl found tortured and murdered. 2006 August Tuesday Press of Atlantic City reports on City Council balking at backing Seth Grossman’s Richard Somers Day event. Sally Hastings of SPHS saves the day. 2006 September 2 Saturday Press of Atlantic City reports on backchannel negotiations [see: Group confident 1804 naval hero will be brought home By Michael Clark]. 2006 September 4 Attorney Seth Grossman organizes an assembly at the grounds of Somers Mansion, where people gather to commemorate Richard Somers and ensure that the anniversary is acknowledged with a civic ceremony. 2006 October 6 Libya issues oil contracts. 2007 June 7, Scotland's First Ministger Alex Salmond writes to Mr. Blair about the agreement to prisoner transfers, telling him of his regret that 'almost no thought' had been given to the role of the Scottish Government despite prison transfer being a matter for the devolved administraion. 2007 July 11 President Bush appoints Gene Cretz US Ambassador to Libya, subject to approval of Senate. Group of Senators announce they will hold up approval of appointment until Libya concludes its final reparation payment to families of victims of Pan Am 103. 2007 August 2 Doctor Recounts Imprisonment in Libya. Palestinian Describes Torture After His Arrest in H.I.V. Case. The New York Times International. By Matthew Brunwasser. 2007 – August - The remains of 72 Americans buried at the American cemetery at the former Wheelus AFB are (in an apparent secret operation) repatriated home and reburied in Delaware. This was the best opportunity to also repatriate the men of the Intrepid but the event is not publicized until after it happened. 2007 September US military forces capture records of foreign al Qaeda fighters in Sinjar province, Iraq, who entered the country via Syria. The Sijar records. Indicate Libyan fighters among them. 2007 - September Annual Richard Somers Day memorial service at Somers Mansion, slideshow and dinner at Gregorys. 2007 October 21 It is confirmed that Megrahi has been diagnosed with prostate cancer which has spread to other parts of his body and is at an advanced stage. 2007 December West Point terrorism center study of the Sinjar records indicates 20% of the fighters from outside Iraq came from Libya. 2008 January 1 Libya assumes rotating Presidency of the UN Security Council. 2008 January 27 Sunday Iraqi official: "Son of Libyan leader had hand in violence. By Robert H. Reid Associated Press BAGHDAD. A son of Libyan leader Moammar Gadafi is behind a group of foreign and Iraqi fighters believed responsible for this week’s devastating explosion in northern Iraq, a security chief for Sunni tribesmen who rose up against al Qaeda said yesterday." 2008 March 1 USS New York, amphibious assault ship Christened. 2008 October 31 – Libya pays $1.5 billion into a fund to compensate the families of victims of Pan Am Flight 103. 2008 October 31 - President Bush issues Executive Order declaring the dispute settled, giving Libya legal immunity from further claims and removing final obstacle to normal relations. 2008 November 8 USS Intrepid aircraft carrier returns to its slip on the Westside Seaport, New York City. 2008 November 11 President Bush gives speech on the Intrepid on Veterans Day. 2008 November 14 An Edinburgh, Scotland court judge refused to free a cancer-stricken Libyan convicted of the bombing of Pan Am Flight 103, Abdel Basset Ali al-Megrahi. 2008 November 17 President Bush calls Gadhafi on the phone to thank him for making payments to Lockerbie victims families. 2008 November 19 Saif al-Gadhafi meets with Sec. State Condi Rice in DC. 2009 February - UK Foreign Office minister Bill Rammell tells Libya's minister for Europe Abdulati Alobidi at a meeting in Tripoli that Prime Minster Gordon Brown did not want to see Megrahi die in jail. 2009 March 12 - Mr. Alobidi attends talks with a Scottish government delegate in Glasglow. 2009 April 29 - A prison transfer agreement (PTA) between the UK and Libya comes into force allowing Megrahi to apply to serve the rest of his sentence in a Libyan jail. He must drop his appeal against his conviction for any PTA to take place. 2009 May 6 - The Scottish government says the Libyan authorities have applied for the transfer of Megrahi. 2009 August 14 In a telephone call US Secretary of State Hillary Clinton urges Scotland's Justice Secretary Kenny MacAskill not to release Megrahi. 2009 August 18 Megrahi's bid to drop his appeal against his conviction is accepted by judges in Edinburgh. 2009 August 20 Kenny MacAskill announces his decision that Megrahi is to be returned to Libya on compassionate grounds. US President Barack Obama says the decision is a "mistake." Prime Minister Gordon Brown sends a letter to Col Gaddafi asking that Libya "act with sensitivity" when Megrahi is returned home but declines to express his own views. 2009 August 21 The UK and the US condemn the "hero's welcome" given to Megrahi as he arrives back in Libya. Claims by Col Gaddafi's son Saif that the decision to release Megrahi was tied to a trade deal are strongly denied by the Foreign Office. 2009 August 22 Libyan television shows pictures of Col Gaddafi meeting Megrahi and praising Gordon Brown and the British government for their part in securing his freedom. FBI director Robert Mueller accuses Mr. MacAskill of making a mockery of the law and giving comfort to terrorists. 2009 August 24 - Mr MacAskill tells an emergency session of the Scottish Parliament it had been his own decision to free Megrahi. It emerges that the Duke of York will not travel to Libya for an official visit in September. 2009 August 25 - Prime Minister Gordon Brown says he was "repulsed" by Megrahi's welcome in Libya and insists the British government had no role in the decision to free him. 2009 August 27 - It emerges that three ministers visited the country in the 15 months leading up to the release of the Lockerbie bomber. 2009 August 28 - Col Gaddafi's son Saif tells a newspaper that Libya's original prisoner transfer deal with the UK had targeted Megrahi and was directly linked to talks on trade and oil, but denies it had anything to do with his eventual release. 2009 August 29 - Leaked letters from the Justice Secretary Jack Straw showed that he backed away from efforts to stipulate that Megrahi be exempt from the PTA "in view of the overwhelming interests of the United Kingdom." 2009 September 1 - Notes taken by the Scottish Government at a meeting with a Libyan minister in March are published. In them, Abdulati Alobidi insists he had been told Gordon Brown did not believe Megrahi should die in prison. Foreign Office minister Bill Rammell confirmed that he had relayed the message during meetings in February. 2009 – September. Richard Somers Day is celebrated at Somers Mansion in Somers Point. 2009 – December – American Professor Benjamin Barber, board member of the Gadhafi Charities Foundation, meets with Saif Gadhafi and US Ambassdor Gene Cretz and gets both to agree on repatriation. 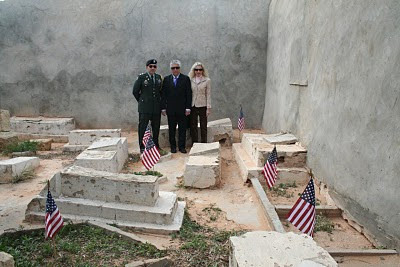 2010 – May – Memorial Day - US Ambassador to Libya Gene Cretz, his wife Annette and military attaches Linville and Garrett place American flags and wreath at the Intrepid graves at Old Protestant Cemetery in Tripoli. They also fly an American flag over the US Embassy and hand deliver it to Somers Point Mayor Jack Glasser. 2010 – May – Tim McGrath’s biography John Barry – American Hero in the Age of Sail is published, prominently mentioning Somers, Decatur, Stewart and their associations with Barry and the city of Philadelphia. 2010 – September. Richard Somers Day is celebrated at Somers Mansion in Somers Point. 2010 – December – Arab Revolt begins in Tunisia, spreads quickly to Egypt, Bahrain, Yeman, Libya, Syria, and to some extent in Algeria, Morocco, Jordan and Iran. 2011 – February 15 – Arab revolt arrives in Bengazzi, Libya. 2011 – February 15/16, 2011 - A riot in Benghazi is triggered by the arrest of human rights activist Fethi Tarbel, who has worked to free political prisoners, Quryna newspaper reports. 2011 – February 17 - Activists designate a day of rage. It is the anniversary of 2006 clashes in Benghazi when security forces killed protesters attacking the city's Italian consulate. 2011 – February 21 - Diplomats at Libya's mission to the United Nations side with the revolt and call on the Libyan army to help overthrow Gaddafi. 2011 - February 22 - Benghazi liberated by rebels. 2011 – February 22 - Gaddafi vows to die "a martyr" in Libya and says he will crush the revolt. 2011 - February 24 - Anti-Libyan government militias take control of Misrata after evicting forces loyal to Gaddafi. 2011 – February 26 - The U.N. Security Council imposes sanctions on Gaddafi and his family, and refers Libya's crackdown on rebels to the International Criminal Court. 2011 - February 28 - EU governments approve a package of sanctions against Gaddafi and his closest advisers including an arms embargo and bans on travel to the bloc. 2011 – February 28 - Gaddafi refuses to acknowledge protests in the streets of Tripoli, saying all Libyans love him. 2011 – Wall Street Journal reporter (Lucette Lagnado) researches article that is not published. 2011 - March 5 - The National Council meets in Benghazi and declares itself sole representative for Libya. 2011 - March 10 - France recognizes the Libyan National Council, the rebel body fighting to oust Gaddafi, as the legitimate representative of Libya's people. Libya suspends diplomatic relations with France the next day. 2011 - March 16 - Forces loyal to Gaddafi are near rebel-held Benghazi. Gaddafi's son Saif al-Islam tells France-based TV channel Euronews: "Everything will be over in 48 hours." 2011 - March 17 - The U.N. Security Council votes to authorise a no-fly zone over Libya and "all necessary measures" -- code for military action -- to protect civilians against Gaddafi's army. 2011 - March 19 - The first air strikes halt the advance of Gaddafi's forces on Benghazi and target Libya's air defences. 2011 - March 22 - "We will not surrender," Gaddafi tells supporters forming a human shield to protect him at his Tripoli compound. 2011- March 28 - Qatar becomes the first Arab country to recognize Libya's rebels as the people's legitimate representative. 2011 - March 30 - Libyan Foreign Minister Moussa Koussa defects and flies to Britain. 2011 - March 29 - A London conference of 40 governments and organizations agrees to set up a contact group comprising 20 countries to coordinate efforts in a post-Gaddafi Libya. 2011- April 10 - Gaddafi accepts a roadmap for ending the conflict, South African President Jacob Zuma says after leading a delegation of four African leaders at talks in Tripoli. 2011- April 11 - Rebels reject an African Union peace plan as it does not address their main demand that Gaddafi quit and it proposes reforming a ruling system they want removed. 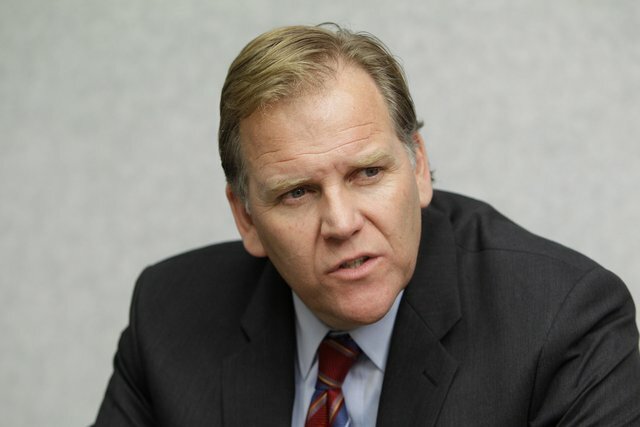 2011 April 12 – Rep. Mike Rogers (R. Mich.) introduces HR 1497 calling for the return of the remains of American military personnel in Tripoli. 2011 - April 13 - Italian Foreign Minister Franco Frattini says his country no longer has any relations with the Gaddafi government. 2011 April 15 – Article published in Press of Atlantic City on efforts of Somers Point citizens to repatriate remains of Somers and Rogers’ congressional resolution. 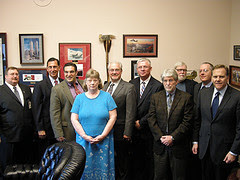 2011 April 15 – Somers Point delegation meets with Rep. Mike Rogers (R. Mich.) and Rep. Frank LoBiondo (R. NJ) in Washington; then meet with national directors of the American Legion. 2011 April 18 – City of Somers Point and Somers Point Historical Society issue a press release concerning meetings in Washington. 2011 - April 29 - Gaddafi, in a live speech, says he is ready for a ceasefire and negotiations, provided NATO "stops its planes." 2011 - April 30 - A NATO missile attack on a house in Tripoli kills Gaddafi's youngest son and three grandchildren. The Libyan leader survives the attack but has not been seen since. 2011 - May 1 - Libya says it regrets the attacks on several embassies saying its police force was overpowered by crowds angered by the NATO strike that killed Gaddafi's son. 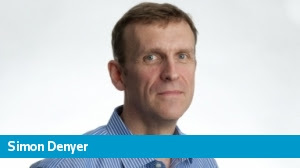 2011 – May 4 – Reuters and Washington Post correspondent Simon Denyer emails and calls from Tripoli, read Remembertheintrepid.blogspot.com and visits cemetery. 2011 - May 5 - Ministers from the contact group, agree in Rome to set up a non-military fund to help the cash-strapped rebels. 2011 – May – National American Legion directors meet and endorse resolution calling for full accounting of American military POWS/MPS and calling for their repatriation regardless of what era they served. 2011 - May 9 - Oil payments for Libyan rebels selling crude oil are being made through a Qatari trust fund in U.S. dollars, a member of the oil and gas support group for Libya says. Around 1 million barrels have been sold at $100 million so far. 2011 - May 13 - The National Transitional Council says it has named officials to a number of portfolios including defence, part of its efforts to set up an effective and united administration. 2011 - May 16 - The International Criminal Court's prosecutor says he has requested arrest warrants for Gaddafi, his son Saif al-Islam, and intelligence chief Abdullah al-Senussi for crimes against humanity. 2011 – May 19 – Edward Culimore writes article on repatriation efforts that is published in the Philadelphia Inquirer. 2011 – May 19-20 – National American Legion officers visit Somers Point and videotape interview residents regarding the repatriation of Somers for planned documentary for their website viewed by 2 million vets. 2011 – May 23 – Rep. Rogers attaches HR 1497 calling for repatriation of remains of American military personnel from Libya to the Defense Authorization Bill, and it is referred to Rules Committee for consideration, along with 200 other proposed amendments. 2011 – May 24 – National Director of American Legion writes powerful letter to Speaker of the House endorsing Rogers’ HR 1497 and requests that it be included in the Defense Authorization Bill. Others, including Somers Point Mayor Jack Glasser and members of the Return Richard Somers Committee of the Somers Point Historical Society make phone calls to key Rules Committee members requesting they include the resolution as part of the Defense Authorization Act. 2011 - May 24 - Top Libyan oil official Shokri Ghanem has not defected and is secretly working for Gaddafi to maintain ties with big oil companies, sources at western firms say. Officials say Ghanem will represent Libya at the June 8 OPEC ministers' meeting. Libya said on May 19 that Ghanem had not defected. 2011 – May 24 - Jordan announces it recognizes the rebel council as a legitimate representative of Libya's people. It also takes measures to freeze financial assets held by the government. 2011 – May 24 – Rep. Rogers makes pitch for HR 1497 to be attached to the Defense Authorization Bill before the House Rules Committee. 2011 - May 25 - South African President Zuma will visit Tripoli for talks with Gaddafi on May 30, the presidency says. 2011 – May 25 – Congress debates Defense Authorization Bill on the floor. 2011 - May 26 - Al Hadi Hadeiba, Gaddafi's ambassador to the EU defects. 2011 - May 26 - Rogers/LoBiondo Amendment passes house with Defense Authorization Act. 2011 - May 27 - House of Representatives passes the Defense Authorization Bill that includes the HR 1497 provision. It now goes to the Senate. 2011 - May 30 - Memorial Day - Simon Denyer's article is published in the Washington Post. 2011 - May 30 - In his first appearance in a month, Gaddafi renews a ceasefire call in talks with visiting South African President Zuma but gives no sign he will heed demands to step down. 2011 - May 30 - Eight high-ranking Libyan army officers appear in Rome saying they are part of around 120 military officials and soldiers who have defected from Gaddafi. 2011 - May 31 - Foreign Minister Franco Frattini opens Italy's consulate in Benghazi and pledges financial support for the rebels. June 1 - Libya's top oil official Shokri Ghanem appears in Rome, saying he defected after the relentless bloodshed. June 3 - China makes its first confirmed contact with Libyan rebels in a meeting in Qatar. June 6 - Libyan rebels enter Yafran, southwest of the capital, previously controlled by loyalist forces. June 7 - Gaddafi vows in a speech broadcast live, to fight to the end, after NATO intensifies air strikes on Tripoli. June 8 - Spain recognises the TNC as the country's legitimate representative. Australia recognises the TNC the next day. June 8 - Western and Arab nations meet rebels in Abu Dhabi to focus on what U.S. officials call the "end-game" for Gaddafi. -- Western and Arab nations meet rebels in Abu Dhabi to focus on what an U.S. official calls the "end-game" for Gaddafi. June 12 - Government artillery barrages strike near Misrata. Rebel fighters have pushed pro-Gaddafi forces out of the city, but government troops still surround it on three sides. Gaddafi forces also heavily bombard Zintan. June 15 - Libya's government approves a $31.4 billion budget for the rest of 2011, to show it is functioning as normal. June 18 - Rebels have run out of money, Ali Tarhouni, their oil chief says. June 29 - France announces it has provided weapons, munitions and food to rebels in the Western Mountains. June 30 - Gaddafi's daughter, Aisha, says in a television interview, her father's government is prepared to cut a deal with the rebels if that was what it took to stop the bloodshed. July 1 - Rebels who advanced to within 80 km (50 miles) of Tripoli are forced to retreat after coming under a barrage of rocket fire from government forces. -- In an address to some 100,000 supporters in Tripoli, Gaddafi urges NATO to halt its bombing or risk seeing Libyan fighters descend on Europe "like a swarm of locusts or bees". July 2 - African Union leaders offer to host talks between the government and rebels on a ceasefire. -- Niger President Mahamadou Issoufou says nations at the AU summit "had been requested" not to act on the arrest warrants for Gaddafi issued by the ICC. July 8 - Thousands of Gaddafi supporters rally in Tripoli's Green Square for Friday prayers. In a speech on television, Gaddafi threatens to send hundreds of Libyans to attack Europe in revenge for the NATO-led military campaign against him. July 14 - Gaddafi, in his latest speech on Libyan television, says he is staying put. "I will fight until the end," he said. "The end of NATO will be in Libya." -- The Gaddafi government has halted all cooperation with Italy's Eni and is talking to other energy groups about new deals, Prime Minister Al-Baghdadi Ali Al-Mahmoudi says. July 15 - Rebel leaders win recognition as the legitimate government of Libya from the U.S. at a meeting in Turkey of the international contact group on Libya. Western nations also say they will increase military pressure on Gaddafi's forces. July 16 - A rare meeting between U.S. diplomats and Gaddafi envoys is held "to deliver a clear and firm message that the only way to move forward, is for Gaddafi to step down." July 20 - Gaddafi could stay in Libya if he gives up power, France says. July 21 - Rebels say a fierce counter-attack by loyalist forces has checked their gains on a frontline east of Tripoli.